Left to right: Lora Fong, assistant attorney general and chief diversity officer, NJ Office of the Attorney General; attorney Alan Dexter Bowman; Karina Fuentes, assistant federal public defender; program moderator Raymond M. Brown of Greenbaum, Rowe, Smith & Davis; U.S. Magistrate Judge Steven C. Mannion, District of New Jersey; Sammi Malek, assistant U.S. attorney; and Rajiv D. Parikh, Genova Burns. 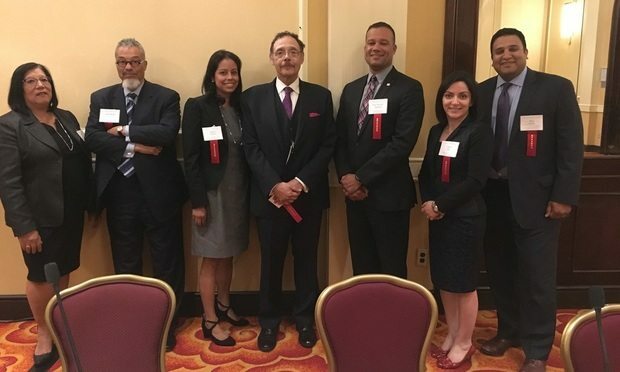 Greenbaum, Rowe, Smith & Davis and the Association of the Federal Bar of New Jersey’s Young Lawyers Division on July 18 presented “Achieving Equality for Minority Attorneys in Federal Court” at the Renaissance Woodbridge Hotel in Iselin, a follow-up event to the association’s May 2018 seminar on women in the courtroom. The seminar included a panel discussion, breakout sessions, and a cocktail reception and networking event. The topic was how minority attorneys can create opportunities to participate in federal court proceedings, on which the panelists offered perspectives. Raymond M. Brown, a partner in Greenbaum Rowe’s litigation department, moderated the panel. Panelists were: U.S. Magistrate Judge Steven C. Mannion of the District of New Jersey; Lora Fong, assistant attorney general and chief diversity officer of the Office of the Attorney General; attorney Alan Dexter Bowman; Karina Fuentes, assistant federal public defender, New Jersey Federal Public Defender’s Office; Sammi Malek, assistant U.S. attorney, U.S. Attorney’s Office for the District of New Jersey; and Rajiv D. Parikh of Genova Burns. In attendance were Chief Judge Jose L. Linares of the District of New Jersey, who gave opening remarks; Joseph A. Hayden Jr. of Pashman Stein Walder Hayden, the association’s past president; Wanda Akin Brown of Wanda M. Akin & Associates; Paul J. Fishman of Arnold & Porter, former U.S. Attorney; Dara Govan, assistant U.S. attorney and president of the Garden State Bar Association; Eric S. Pennington, business administrator for the City of Newark; Judge Michael A. Chagares of the U.S. Court of Appeals for the Third Circuit; current association president William T. Reilly of McCarter & English; and immediate past president Sabrina Comizzoli, of the U.S. Attorney’s Office’s Appeal Division. The program also was sponsored by the Asian Pacific American Lawyers Association of New Jersey, the Garden State Bar Association, the Hispanic Bar Association of New Jersey, the New Jersey Muslim Lawyers Association, Seton Hall University School of Law, and the South Asian Bar Association of New Jersey.